In the three years I've been attending SXSW with no badge or even a music wristband I think i've developed a good idea of which events to stay away from. Ordinarily that would most certainly include The Fader Fort, but when we found out CF's artist to watch Buscabulla would be performing on the main stage we knew we had to be there. 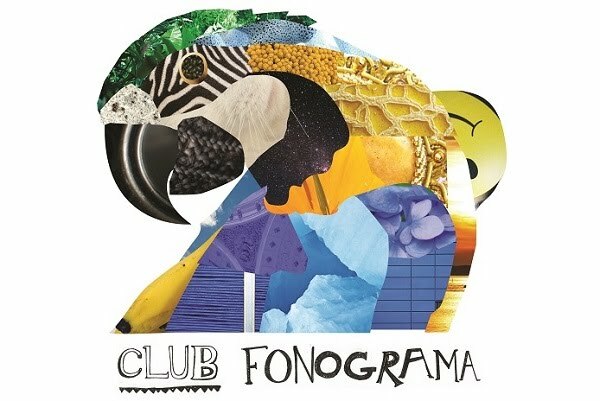 Thankfully Club Fonograma made the guest list and we were able watch as Raquel Berrios and her band brought a potentially dead ambiente to life with a mesmerizing 30 minute set. We caught up with Raquel later that night at a Nacional showcase, just an hour before A.J. Davila performed, for a brief chat. Giovanni Guillén: A lot of our writers are already calling you the breakout act of 2014- but most of us know very little about you. What's your background in music? How did you get started? Raquel Berrios: I was first a DJ. I've been a DJ ever since I got to New York in 2008. I started DJign vinyl and I kind of inherited my dad's record collection that included salsa, calypso, folk music. It was pretty varied. I also worked in a music store Tropicalia in Furs and then got even more into psychedelic latin music. RB: Caetano, Gilberto Gil, Os Mutantes, the whole Tropicalia movement and other Brazilian stuff. And I started sort of producing stuff at home on Garage Band, really simple things and singing over it. I've always played guitar but I had never really been musically trained and it wasn't until I met my boyfriend, Luis Alfredo Del Valle, that we actually started to take those samples and the small projects I had and actually started converting them into songs and then after that I took piano, I took sort of a crash course in music theory and started to get a little more serious about the project. GG: I'm a really big fan of your Tumblr, you have so many visual references that I think make a great introduction to Buscabulla. Then there's also a lot of older music that you post. How much of that did you inherit from your parents and how much is from your own discovery? RB: It's half and half. The seed was planted by my parents but when I go back and I look at 70's and 80's Argentinian music that's all out of from my own discovery. Like maybe because my dad exposed me to rock that sort of made me interested in seeing what was latin rock like in the 70's and 80's. So the seed was planted by them, but definitely the digging and exploring is another thing that's happened and I guess you do see that on the Tumblr. It's mixed in with a lot of other stuff (laughs). GG: It's pretty well known at this point that you've been working with Dev Hynes. How much of the new songs were already ready before he stepped in? What is his role really? RB: When we got in the studio with Dev in mid February, we pretty much had three songs in demo form. We all sat down and discussed them, and he pretty much acted as an advisor both in helping us achieve a more evolved sound and filling in missing parts. He played guitar on a lot of the tracks and added his own to them. He also helped in a lot of decision making, but he definitely let us be Buscabulla. You know, he's written songs for Sky Ferreira and produced and written for Solange, but this time around he let us be who we were, and then just sort of added a touch of who he is. GG: Yeah, that's interesting because the role of a producer is really vague. There's people like Rick Rubin who kind of lets artists just do what they do. RB: It's funny because we kept bringing up Rick Rubin when we first started working with Dev Hynes. Everyone thinks a producer is gonna come and put his stamp on an artist's sound, but what he was really interested from the beginning was our unique sound. He acted as a great medium with his vast musical knowledge, adding touches of his own style while letting us be who we are. I guess you'll see it once it comes out. You just have to wait and see. GG: Recalling what I heard today (at the Fader Fort)- the new songs sound kind of hazy and intense. How do you describe them to people? RB: There's a little bit of everything. The first single that we're gonna release and already made a video for is called "Caer." I love to think of that song as a midway point between "Sono" and our "Tu loco-loco" cover, you know, between samples and actually playing live. The other songs- "Temporal" which is another song from the EP is also really sample driven. I kind of did that one on my own. The demo was done at home in one night, just sat down with it. It's definitely more experimental. Sort of based on coming from the Caribbean. "Temporal" means hurricane. Then there's "Métele" which I don't really know how to describe that one. It's definitely more soul-like and Dev put a really cool touch on that one. We haven't finished mixing it so we'll just have to see. GG: Besides older music that you're really familiar with how closely do you follow the current scene, like what's happening in Puerto Rico? RB: Right now there's a lot of cool stuff happening, I definitely listen to everything that people are doing. Super excited about Fuete Billete. I've sort of known these guys forever, back when they were Cienca Fixión. It's really awesome how they're evolving with this new project as well as seeing Carlitos and AJ (from Davila 666) take different musical paths with their respective projects. And just the San Juan scene in general, we played a show there in November and Luis and I came back feeling really excited by the bands there. There's another group called Fantasmes that's really awesome. I think right now it's really diverse. I can totally see the influence of the internet and how it's helped people find their niche. Years back in Puerto Rico it seemed like everybody was doing the same type of music. But now it's different. It's such a small island, it's great to see a tiny indie scene doing very different projects. GG: You mentioned how far Fuete Billete and A.J. Davila have come, where do you want to take Buscabulla? Or where do you see it going? RB: I think a woman I always look at as an artistic example is Juana Molina. There's just something about the scale and artistic level of the project that she's built that I love. She has been very unique and even if she's not huge, people know her. She can travel the world and do intimate shows. There's something inspiring about how she's led her musical career and how it keeps going, regardless of age or looks. I think I aspire to something similar to what she's created. I really want to make cool interesting music in Spanish, you know? I want it to be accessible but also have edge. I want it to be complex.